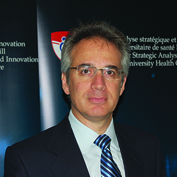 Dr. Armen Aprikian is Professor of Oncology and Urology at McGill University. In 2006, he took on responsibility for consolidating all cancer-related services at the MUHC. His preoccupations have been to reduce the stress on patients undergoing treat-ment for cancer and enhance research capacity as an integral part of the Mission. His own research focus is currently on the biology of prostate cancer progression and familial and genetic prostate cancer.